Economic inequality, especially that between developed and developing nations, remains the greatest source of suffering on this planet. In early 2011, the authoritative Economist magazine and the WEF in Davos, both perceived global inequality as a major global problem. (Although the Economist proposed a quick-fix: increase social mobility). The complex causes and possible remedies can perhaps be debated endlessly, but what is clear are the empirical facts. Income and wealth are distributed according to a very specific probability distribution, called scaling law, power law, fat tailed distribution or 80-20 rule. To put it pithily: nearly all have very little and very few have very much. This was already observed by V. Pareto 1906 in and still holds today. For scientists, the emergence of scaling law distributions is nothing uncommon (although there is no conclusive understanding of their origins). In fact, a huge range of natural phenomena display scaling laws: from physics, biology, earth and planetary sciences, computer and network sciences, demography and social sciences to linguistics. It seems, that every complex system in nature, i.e., systems comprised of many interacting or interconnected parts, is associated with scaling law distributions. So we shouldn't take economic inequality too personal, but understand it as a systemic "feature". Taken from the Height of Inequality (the numbers are said to be from 1971, so this should be an underestimation of the current situation). More in the Economist about this as well. David Tepper, at Appaloosa Management, personally earned an estimated US$4 billion in 2009. On the other side, we have an estimated 5.15 billion people, or roughly 80% of the world's population, living on US$10.00 a day or less in 2005. Or in 2002, an estimated 17% of the world population lived on US$1 or less per day. Visualize this: territory size shows the proportion of all people living on less than or equal to US$1 in purchasing power parity a day. From worldmapper.org (check out there many maps visualizing various statistics). For the poor, there is another pressing issue, compounding the problem: the poorest 2 billion people spend 50%-70% of their income on food. The fact that inequity is described by scaling law distributions also means that it has fractal properties: you can zoom in and still find the same kind of inequality at all scales. The wealth share estimates reveal that the richest 2 per cent of adult individuals own more than half of all global wealth, with the richest 1 per cent alone accounting for 40 per cent of global assets. The corresponding figures for the top 5 per cent and the top 10 per cent are 71 per cent and 85 per cent, respectively. In contrast, the bottom half of wealth holders together hold barely 1 per cent of global wealth. Members of the top decile are almost 400 times richer, on average, than the bottom 50 per cent, and members of the top percentile are almost 2,000 times richer. According to the latest Global Wealth Report from Credit Suisse, the people with a household net worth of $1 million or more represent less than 1% of the world’s population but own 38.5% of the world’s wealth: about $89 trillion. That’s up from a share of 35.6% in 2010. Their wealth increased by about $20 trillion last year. In fact, the wealth of millionaires and billionaires grew 29% last year. From the Wall Street Journal's blog. A report from the Congressional Budget Office (CBO) points out that income inequality in America has not risen dramatically over the past 20 years—when the top 1% of earners are excluded. With them, the picture is quite different. The upper 1 percent of Americans are now taking in nearly a quarter of the nation’s income every year. In terms of wealth rather than income, the top 1 percent control 40 percent. Their lot in life has improved considerably. While the top 1 percent have seen their incomes rise 18 percent over the past decade, those in the middle have actually seen their incomes fall. For men with only high-school degrees, the decline has been precipitous—12 percent in the last quarter-century alone. All the growth in recent decades—and more—has gone to those at the top. Economists long ago tried to justify the vast inequalities that seemed so troubling in the mid-19th century—inequalities that are but a pale shadow of what we are seeing in America today. The justification they came up with was called “marginal-productivity theory.” In a nutshell, this theory associated higher incomes with higher productivity and a greater contribution to society. It is a theory that has always been cherished by the rich. Evidence for its validity, however, remains thin. First, growing inequality is the flip side of something else: shrinking opportunity. The more divided a society becomes in terms of wealth, the more reluctant the wealthy become to spend money on common needs. The rich don’t need to rely on government for parks or education or medical care or personal security—they can buy all these things for themselves. But one big part of the reason we have so much inequality is that the top 1 percent want it that way. The most obvious example involves tax policy. Lowering tax rates on capital gains, which is how the rich receive a large portion of their income, has given the wealthiest Americans close to a free ride. In markets with many widely held corporations (mostly in Anglo-Saxon countries), the observed local distribution of ownership, meaning shareholder democracy, actually goes hand in hand with a global concentration of ownership (and control), only visible from the bird's-eye view given by the network perspective, where the ownership and control ends up in the same few hands. About 750 top economic agents in the global ownership network of ~600k nodes potentially control 80% of the value (operating revenue) of the ~43k transnational corporations. Of these, the top 50 already have nearly 40%. 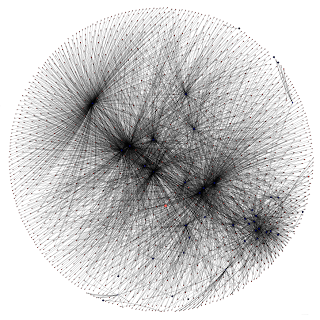 The tiny core of the network, comprised of ~1300 nodes, holds ~40% of the potential control. There are about 150 top agents in the core, potentially controlling about 38%. 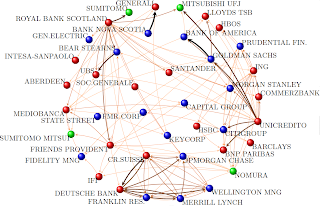 See the Backbone of complex networks of corporations: The flow of control and the Network of Global Corporate Control. Or watch a TEDx talk about it. The Occupy Wall Street claim that 1 per cent of people have most of the wealth reflects a logical phase of the self-organising economy. (Personally, I feel the word "logical" is perhaps a bit too strong.) However, he "suspects they [the companies in the tiny core of the ownership network that have a disproportionately large amount of control] will compete in the market but act together on common interests. Resisting changes to the network structure may be one such common interest." So, What About Greed Then? To this day, the willingness of a Wall Street investment bank to pay me hundreds of thousands of dollars to dispense investment advice to grownups remains a mystery to me. I was 24 years old, with no experience of, or particular interest in, guessing which stocks and bonds would rise and which would fall. I stumbled into a job at Salomon Brothers in 1985 and stumbled out much richer three years later, and even though I wrote a book about the experience, the whole thing still strikes me as preposterous—which is one of the reasons the money was so easy to walk away from. I figured the situation was unsustainable. Sooner rather than later, someone was going to identify me, along with a lot of people more or less like me, as a fraud. Sooner rather than later, there would come a Great Reckoning when Wall Street would wake up and hundreds if not thousands of young people like me, who had no business making huge bets with other people’s money, would be expelled from finance. Again from here. Of course, this is all debatable, from his sincerity, to possible hidden agendas, to being biased by wanting to write a popular book. Take the now-infamous example of the recently ousted Merrill Lynch chief John Thain, who not only splurged on his office decor [over $1 million] but also had the audacity to propose a $10 million bonus for himself. In recognition of what? A year's work in which the company continued to make bad business decisions, lost about 80 percent of its value, sold itself to Bank of America to stave off possible collapse and appears to have seriously damaged its buyer's franchise? Bank of America ($45 billion in bailout money) sponsored a five-day "NFL experience" at the Super Bowl; Wells Fargo ($25 billion in bailout funds) was planning 12 nights in Las Vegas for select employees. From You Can Cap The Pay, But The Greed Will Go On, Washington Post, February 8, 2009. From On Wall Street, Bonuses, Not Profits, Were Real, New York Times, December 17, 2008. London’s pernicious financial world reveals itself in all its ugliness. As a primer to back-stabbing, bullying, drug-taking, gambling, boozing, lap-dancing, this takes some beating...a necessary and valuable boo. Engaging, timely and important...an effective indictment of the narcissism and decadence of City life. Before, he became notorious for his column City Boy, which he wrote anonymously in The London Paper. There he gave detailed accounts of greed, drug-taking, prostitutes, gambling and fraud. Recently, I read a comment where the person asked the question, of how much of the risk appetite of investment banking was fueled by cocaine. In Italy, the government is currently debating drug tests for traders. There is allegedly a new study correlating market volatility with drug abuse among traders (the news article claiming this). I was in this game for the money. The low hanging fruit, i.e. idiots whose parents paid for prep school, Yale, and then the Harvard MBA, was there for the taking. These people who were (often) truly not worthy of the education they received (or supposedly received) rose to the top of companies such as AIG, Bear Stearns and Lehman Brothers and all levels of our government. All of this behavior supporting the Aristocracy, only ended up making it easier for me to find people stupid enough to take the other side of my trades. I now have time to repair my health, which was destroyed by the stress I layered onto myself over the past two years, as well as my entire life -- where I had to compete for spaces in universities and graduate schools, jobs and assets under management -- with those who had all the advantages (rich parents) that I did not. May meritocracy be part of a new form of government, which needs to be established. First, I point out the obvious flaws, whereby legislation was repeatedly brought forth to Congress over the past eight years, which would have reigned in the predatory lending practices of now mostly defunct institutions. These institutions regularly filled the coffers of both parties in return for voting down all of this legislation designed to protect the common citizen. This is an outrage, yet no one seems to know or care about it. If wealth was the inevitable result of hard work and enterprise, every woman in Africa would be a millionaire. The claims that the ultra-rich 1% make for themselves – that they are possessed of unique intelligence or creativity or drive – are examples of the self-attribution fallacy. Moreover, the accuracy of forecasts of financial experts is highly doubtful and the need for advice from experts may be more a psychological than practical thing. "We believe in experts in the same way that our ancestors believe in oracles." Taken from this Economist article. Innovation is not generated in the power center (management) of a corporation, but instead, exactly by such employees, who diverge from the prevailing mindset of the company. (From the syllabus, translation mine.) And what does this say about income inequality, Gini coefficients, and who gets payed how much for doing what exactly? [...] studies also show that once people assume positions of power, they’re likely to act more selfishly, impulsively, and aggressively, and they have a harder time seeing the world from other people’s points of view. This presents us with the paradox of power: The skills most important to obtaining power and leading effectively are the very skills that deteriorate once we have power. Moreover, recent studies have indicated that the higher the social class and the wealthier the individuals are, the higher the tendency of unethical behavior and the less generous, charitable, trusting and helpful they proved to be. In general bad behavior appears to be spurred by greed. See links here. Governments have been toppled in Egypt and Tunisia. Protests have erupted in Libya, Yemen, and Bahrain. The ruling families elsewhere in the region look on nervously from their air-conditioned penthouses—will they be next? [...] As we gaze out at the popular fervor in the streets, one question to ask ourselves is this: When will it come to America? In important ways, our own country has become like one of these distant, troubled places. Of all the costs imposed on our society by the top 1 percent, perhaps the greatest is this: the erosion of our sense of identity, in which fair play, equality of opportunity, and a sense of community are so important. It is this sense of an unjust system without opportunity that has given rise to the conflagrations in the Middle East: rising food prices and growing and persistent youth unemployment simply served as kindling. With youth unemployment in America at around 20 percent (and in some locations, and among some socio-demographic groups, at twice that); with one out of six Americans desiring a full-time job not able to get one; with one out of seven Americans on food stamps (and about the same number suffering from “food insecurity”)—given all this, there is ample evidence that something has blocked the vaunted “trickling down” from the top 1 percent to everyone else. All of this is having the predictable effect of creating alienation. These and other blessings are showered upon us [the super-rich] by legislators in Washington who feel compelled to protect us, much as if we were spotted owls or some other endangered species. It’s nice to have friends in high places. and claims to pay half the percentage in taxes as his employees. Taxes do not make the wealthy poor. in an ongoing debate, in which some of millionaires have signaled their support of higher taxes for the rich. Similar advances can be seen in France, where 16 top managers of big French companies have signed a petition supporting higher taxes for the rich. More here. The most extreme scaling law distribution of wealth is one person having everything. The most extreme Gaussian distribution, a delta function, would mean that everyone has exactly the same wealth. In-between, there is a multitude of possibilities. What do you think is equality? But is this all really the right and relevant way to globally asses the well-being of the world's population? Shouldn't the focus be more related to happiness (which, admittedly, is hard to define) and its pursuit? For instance, something like a happiness index? The obvious answer is: no of course not, financial hardship always results in unhappiness. In contrast, how many people pursue demanding careers, make personal sacrifices and get high compensation actually because they believe this will increase their level of happiness? Tasting the same wine three times, but experiencing more pleasure because you thought one was expensive: Marketing actions can modulate neural representations of experienced pleasantness, PNAS, 2008. Feeling pain depends on what your beliefs are about the current experience: believing you are deliberately being harmed intensifies the experience of pain. Paul Bloom's TED talk the origins of pleasure. Daniel Gilbert's TED talks why are we happy? why aren't we happy? and exploring the frontiers of happiness. Daniel Kahneman's TED talk the riddle of experience vs. memory. Matthieu Ricard's TED talk habits of happiness. My sense is that a lot of people in finance hate what they do. There's no passion. But they are trapped by the money. So levels of income are, if anything, inversely related to felicity. Perceived happiness depends on a lot more than material welfare. scaling the function’s argument x preserves the shape of the function f(x), called scale invariance. are all described by scaling-law distributions. First used to describe the observed income distribution of households by the economist Pareto in 1897, the recent advancements in the study of complex systems have helped uncover some of the possible mechanisms behind this universal law. However, there is as of yet no real understanding of the physical processes driving these systems. Processes following normal distributions have a characteristic scale given by the mean of the distribution. In contrast, scaling-law distributions lack such a preferred scale. Measurements of scaling-law processes yield values distributed across an enormous dynamic range (sometimes many orders of magnitude), and for any section one looks at, the proportion of small to large events is the same. Historically, the observation of scale-free or self-similar behavior in the changes of cotton prices was the starting point for Mandelbrot's research leading to the discovery of fractal geometry; see (Mandelbrot, 1963). It should be noted, that although scaling laws imply that small occurrences are extremely common, whereas large instances are quite rare, these large events occur nevertheless much more frequently compared to a normal (or Gaussian) probability distribution. For such distributions, events that deviate from the mean by, e.g., 10 standard deviations (called “10-sigma events”) are practically impossible to observe. For scaling law distributions, extreme events have a small but very real probability of occurring. This fact is summed up by saying that the distribution has a “fat tail” (in the terminology of probability theory and statistics, distributions with fat tails are said to be leptokurtic or to display positive kurtosis) which greatly impacts the risk assessment. So although most earthquakes, price moves in financial markets, intensities of solar flares, ... will be very small, the possibility that a catastrophic event will happen cannot be neglected. It should be noted, that another prominent feature of real-world networks, namely the so-called small-world property, is separate from a scale-free degree distribution, although scale-free networks are also small-world networks; (Strogatz and Watts, 1998). For small-world networks, although most nodes are not neighbors of one another, most nodes can be reached from every other by a surprisingly small number of hops or steps. Most real-world complex networks - such as those listed at the beginning of this section - show both scale-free and small-world characteristics. Some general references include (Barabasi, 2002), (Albert and Barabasi, 2001), and (Newman, 2003). Emergence of scale-free networks in the preferential attachment model (Albert and Barabasi, 1999). An alternative explanation to preferential attachment, introducing non-topological values (called fitness) to the vertices, is given in (Caldarelli et al., 2002). Next to distributions of random variables, scaling laws also appear in collections of random variables, called stochastic processes. Prominent empirical examples are financial time-series, where one finds empirical scaling laws governing the relationship between various observed quantities. See (Guillaume et al., 1997), (Dacorogna et al., 2001) and (Glattfelder et al., 2011). Glattfelder J. B., Dupuis A., and Olsen R. B., 2011, Patterns in high-frequency FX data: Discovery of 12 empirical scaling laws, Quantitative Finance, 11(4), 599 - 614. 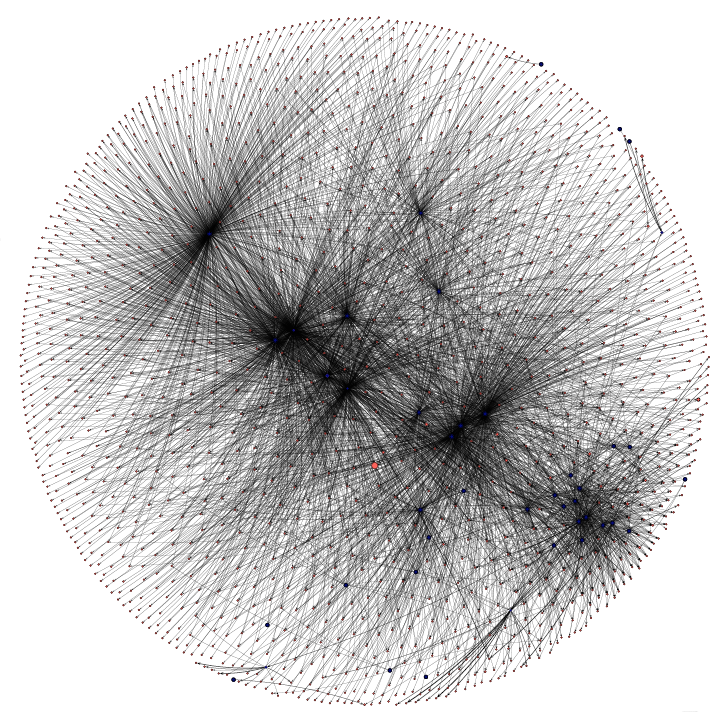 Strogatz S. H. and Watts D. J., 1998, Collective Dynamics of ‘Small-World’ Networks, Nature, 393, 440–442. 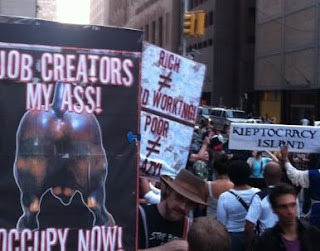 What's up with Occupy Wall Street? Just a bunch of hippies? A group of whiny complainers? Or the mirror image of the Tea Party: a radical, ideology-driven, left-wing political movement? The top 1 percent have the best houses, the best educations, the best doctors, and the best lifestyles, but [...] their fate is bound up with how the other 99 percent live. Let's see what some commentators are saying (italics refer to quotes, see sources at the end). Occupy Wall Street: The Differences? Occupy Wall Street: The Commonalities? End the Collusion Between Government and Large Corporations/Banks, So That Our Elected Leaders Are Actually Representing the Interests of the People (the 99%) and Not Just Their Rich Donors (the 1%). Investigate Wall Street and Hold Senior Executives Accountable for the Destruction in Wealth that has Devastated Millions of People. Return the Power of Coining Money to the U.S. Treasury and Return to Sound Money. Limit the Size, Scope and Power of Banks so that None are Ever "Too Big to Fail" and in Need to Taxpayer Bailouts. Repeal the Patriot Act, End the War on Drugs and Protect Civil Liberties. End All Imperial Wars of Aggression, Bring the Troops Home from All Countries, Cut the Military Budget and Limit The Military Role to Protection of the Homeland. So, What About Greed and Inequality? Yet even if the protests are small and muddled, it is dangerous to dismiss the broader rage that exists across the West. There are legitimate deep-seated grievances. Young people – and not just those on the streets – are likely to face higher taxes, less generous benefits and longer working lives than their parents. More immediately, houses are expensive, credit hard to get and jobs scarce – not just in old manufacturing industries but in the ritzier services that attract increasingly debt-laden graduates. In America 17.1% of those below 25 are out of work. Across the European Union, youth unemployment averages 20.9%. In Spain it is a staggering 46.2%. Only in Germany, the Netherlands and Austria is the rate in single digits. It is not just the young who feel squeezed. The middle-aged face falling real wages and diminished pension rights. And the elderly are seeing inflation eat away the value of their savings; in Britain prices are rising by 5.2% but bank deposits yield less than 1%. In the meantime, bankers are back to huge bonuses. To the man-in-the-street, all this smacks of a system that has failed. Neither of the main Western models has much political credit at the moment. European social democracy promised voters benefits that societies can no longer afford. The Anglo-Saxon model claimed that free markets would create prosperity; many voters feel instead that they got a series of debt-fuelled asset bubbles and an economy that was rigged in favour of a financial elite, who tookall the proceeds in the good times and then left everybody else with no alternative other than to bail them out. To use one of the protesters’ better slogans, the 1% have gained at the expense of the 99%. If the grievances are more legitimate and broader than previous rages against the machine, then the dangers are also greater. Populist anger, especially if it has no coherent agenda, can go anywhere in times of want. The 1930s provided the most terrifying example. A more recent (and less frightening) case study is the tea party. The justified fury of America’s striving middle classes against a cumbersome state has in practice translated into a form of obstructive nihilism: nothing to do with taxes can get through Washington, including tax reform. OF ALL the many banners being waved around the world by disgruntled protesters from Chile to Australia the one that reads, "We Are the 99%" is the catchiest. It is purposefully vague, but it is also underpinned by some solid economics. A report from the Congressional Budget Office (CBO) points out that income inequality in America has not risen dramatically over the past 20 years—when the top 1% of earners are excluded. With them, the picture is quite different. Ownership network, more info and 3d video on youtube. In a nutshell, it's an empirical and interdisciplinary effort to understand a vast economic dataset using methods from the study of complex networks. The analysis focuses, on the one hand on ownership, and on the other hand on control, and reports novel findings for both. It should be noted that ownership is an objective, measurable quantity and that control has to be estimated from it. As in all fields of science, classification and quantification are the first necessary steps in the process of in-depth understanding of novel phenomena. You are also cordially invited to join the discussion at PLoS ONE, where our paper is "available for commenting and debate by the readers, making [it] the start of a scientific conversation". It is comprised of ownership relations of 37 million economic agents (natural persons, families, foundations, government agencies, listed and unlisted companies, etc.) from early 2007, located in 194 countries. We identify and focus on about 43k transnational corporations (TNCs) in 116 countries, defining a network of 600k nodes. It is Bureau van Dijk's commercial Orbis database, used, among others, by reinsurance companies, banks and government agencies. a.) What is the global architecture of ownership (e.g., TNCs may remain isolated, cluster in separated coalitions, or form a large connected component)? b.) How is control distributed globally? c.) Who are the key economic actors? make the network vulnerable to instability, see  or . a.) Our novel methodology extends the known methods for computing control from ownership, and remedies their shortcomings. b.) Control is proxied by the potential control over the TNCs operating revenue, referred to as network control in the paper. This estimate the percentage of control from the network of direct and indirect ownership relations (using three different models) and multiples this level of control with the operating revenue of the firms a shareholder is connected to (directly and indirectly). c.) This measure of control can be understood as a quantity flowing through the network, as the methodology is highly attuned to indirect relations between nodes. d.) Our study is also relevant to the field of complex networks in general, since the methodology can be applied to discover influential nodes in any network where resources are flowing along weighted directed edges. a.) The network is seen to organize as follows: there are many (~23k) small clusters of connected nodes (called weakly connected components) and then there is one huge connected component, where 77% of all the nodes are located. See the scaling-law distribution of the sizes of the weakly connected components in Figure S6 in the Supporting Information. Interestingly, although 64% of the TNCs are scattered among the many small connected components, they only account for 6% of the operating revenue. In other words, 1/3 of the TNCs are found in the huge connected component and represent nearly all the value. See Figure 2B in the main text. b.) 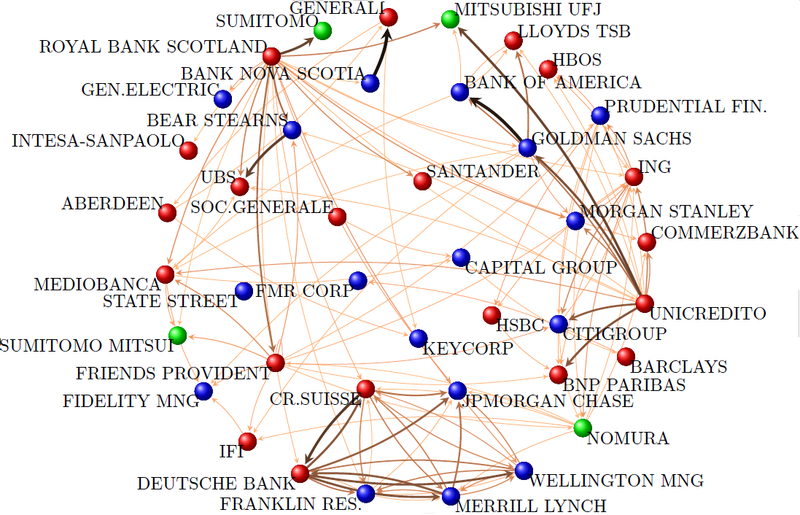 The topology of this largest weakly connected component has a tiny, but dominant core (in network speak: the largest strongly connected component defining a bow-tie topology) of about 1300 mostly US and GB financial intermediaries. This observation has possible implications for global systemic risk and global market competition (see more in item 7.). i.) 737 top economic agents in the network of 600508 nodes control 80% of the value (operating revenue) of the 43060 TNCs. ii.) The core, comprised of 1318 nodes, holds 39% of the control. iii.) There are 147 top agents in the core, controlling 38.4%. e.) The top actors are in the core and hence are interconnected and do not carry out their business in isolation. Observe, that findings a.) to c.) are based solely on the objective ownership data, and require no computation of control. Additional information here and here. a.) Economists are only slowly starting to turn their attention to economic networks. This said, there is an interesting gap in the literature regarding the tools and models used to do so (see Section 1.2.3 in ). This is the first analysis of a global dataset on ownership, using a complex networks approach. b.) It is a starting point for future research. Determining the true implications is up to other scholars to debate on. c.) Open question: is the core of top actors an emergent property or the result of planned coordination? We tend to think it is an emergent property of the network dynamics. a.) Pushing an economics or socio-political agenda. c.) An exact, unambiguous measurement of real-world control. "Because interpreting and analyzing these kinds of data is difficult, [Davis] says, the analysis serves more as 'an impression of the moon's surface you get with a telescope. It's not a street map.'" Gerald Davis, economist at the University of Michigan in Ann Arbor, quoted from here. d.) Alleging that the top agents are colluding. 7.) Why study ownership networks? a.) Previous studies looked at the impact of globalization forces and corporate governance reforms over time on the network topology and found that there was an unexpected resilient structure of powerful agents which was unaffected by these external forces [3,4]. b.) A cross-country analysis revealed that in markets with many widely held corporations (mostly in Anglo-Saxon countries), this local distribution of ownership actually goes hand in hand with a global concentration of ownership (and control), only visible from the bird's-eye view given by the network perspective . c.) Complex ownership patterns, such as cross-shareholdings (e.g., when firms mutually hold shares of each other), are extensively studied motifs in the corporate governance literature and correspond to strongly connected components in networks. Previous studies (on small samples) have shown that cross-shareholdings significantly reduce competition. Accordingly, antitrust institutions all around the world take the existence of complex cross-shareholding structures very seriously. However, they lack the analytical and quantitative tools to deal with large networks. d.) For some time economic theory has supported the idea that more connected networks are more stable. In contrast, recently, the work of some scholars as well as the view of some authoritative policy makers predict that a higher level of interconnections among financial institutions can lead to higher systemic risk . e.) The network structure matters: the presence of indirect links can significantly amplify the control (or ownership) held by certain economic agents. If one defines the leverage as the ratio between the control we compute, which takes into account the whole network, and the direct control of agents, the resulting probability distribution is scale free (see Figure 4.10 and Section 4.3.3 in ). This means that some agents are able to gain a high level of control because of the presence of indirect ownership relations. Usually, this happens by shareholders having control over small firms, which in turn control larger corporations and so forth. Such ownership structures are also called pyramids but were never studied at a global level. Recall the pyramidal group of indirect ownership around Marco Tronchetti Provera, allowing him to control Telecom Italia, one of the world's largest telecom companies, with a disproportional small amount of equity. f.) General network measures have meaning in ownership networks: the (scaling-law) distribution of the out-degree gives a measure of portfolio diversification (see Figure S5A in the Supporting Information); the distribution of the sizes of the weakly connected components gives a measure of how integrated or fragmented a market is (see the scaling-law distribution in Figure S6 in the Supporting information); the position of an agent in the network can be indicative of its importance. P1: "OMG they discovered financial institutions hold shares! What a scandal!" A1: It is obvious that large mutual funds own many shares. However, what we are saying is that the potential control they have is surprisingly high. A portfolio manager would arguably go for a diversification strategy and not a controlling one. P2: "Everybody knows this. It is all so obvious." A2: There is a big difference between suspecting the existence of a fact and in empirically demonstrating it. We are not aware of an existing study which gives actual empirical evidence of these findings, which some common wisdom indeed anticipated. "'This is empirical evidence of what’s been understood anecdotally for years,' says information theorist Brandy Aven of the Tepper School of Business at Carnegie Mellon in Pittsburgh." (quote from here). P3: "You cannot really infer control from ownership." A3: The separation of ownership and control has been debated in the scholarly literature for decades (see references in Section 6.2.1 in ). Although there are many aspects which make the estimation of control from ownership hard to asses (nonvoting shares, dual classes of shares, multiple voting rights, golden shares, voting right ceilings, proxy votes, etc. ), researchers have provided, and extensively used, different simple models believed to proxy the control gained from ownership, such as the linear model, assuming the one-share-one-vote principle, or a threshold model, assigning unequivocal control if the percentage of ownership exceeds the threshold. Quite a lot of attention has been devoted to the analysis of ownership and control of individual corporations and of small groups of firms, but never has a large ownership network been investigated. In  we added a novel model, that looks at the relative distribution of shares. Even with a small shareholding, if all others hold significantly smaller shares, this model assigns a high level of control. We computed control using all three fundamentally different models. Neither the topology of the network, nor the distribution of control, nor the identity of the top holders significantly changes in these different scenarios. This unexpected robustness, or invariance, of such global control measures is encouraging, because it means that neither are the models computing arbitrary numbers, nor can the three models have the same bias in computing control the wrong way. So, although for individual agents the computation of direct control can appear arbitrary, the existence of this "aggregated" agreement in the computation is indeed a positive indication that the results are in fact not just spurious or an artifact of the model details. But, as we caution, these numbers are, in any case, an approximation. P4: "But funds don't exert control." A4: The question, if funds do or do not exert control, is still being debated in the scholarly literature. It is known that US mutual funds do not always seek to exert control. However, this applies only to them operating in the US. Indeed, the same funds have been shown to exert their power when operating in Europe. We are not aware of a systematic global study about the control financial institutions wield over the companies they have ownership in world-wide. Moreover, control is defined in these studies in a very specific way (for instance the propensity to vote against the management when it comes to issues of corporate governance). In any case, there are 49 mutual funds among the top 737 top holders. Control can be exerted in ways which are not always visible. We state: "For example, a mutual fund owning some percent of a large corporation may try to impose job cuts because of a weak economic situation. This can happen: (i) without voting and (ii) although the fund does not plan to keep these shares for many years. In this case, the influence of the mutual fund has a direct impact on the company and its employees. Furthermore, mutual funds with shares in many corporations may try to pursue similar strategies across their entire portfolio." Moreover, studies on the network of directors, the boards they serve on, and the interlocks, have revealed these networks to be scale free . This means a few directors are on very many boards. These ties could also be seen as potential channels, through which control can be exerted covertly, when the directors meet in person. In being cautious, we cannot exclude that the top holders we identify do not globally exert their power in some way. Especially, if we allow for the fact, that control can also be exerted covertly. This is why we talk about potential power in the context of the control numbers we compute. Even if some top holders indeed do assume a passive role, this could be by their own choosing and change anytime. For references, consult Section 6.2.5 in . and generally Section 6.2 for more concerns that have been addressed. a.) Keep an open mind and question all assumptions, also supposedly established ones. b.) Let the data speak, not dogmas. c.) Take the interconnectedness serious: look for and try and understand the network behind complex phenomena. d.) Use formal tools that can deal with huge amounts of data and complexity in general.